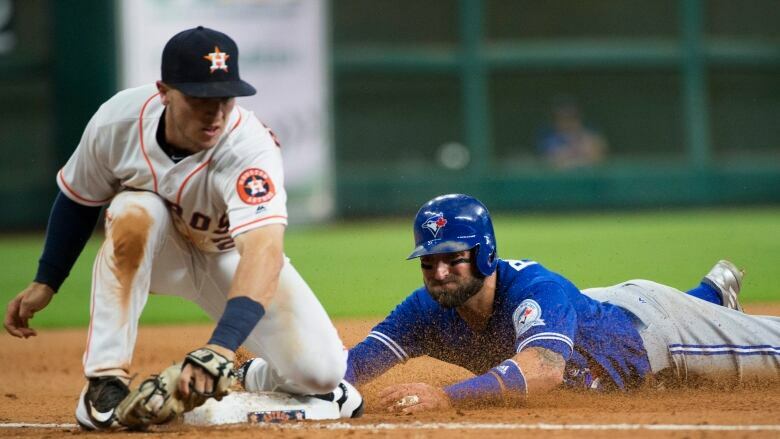 The Toronto Blue Jays placed outfielder Kevin Pillar on the 15-day disabled list Monday with a left thumb sprain and will recall outfielder Darrell Ceciliani from Triple-A Buffalo. Toronto recalls outfielder Darrell Ceciliani from Triple-A Buffalo. The Toronto Blue Jays will be without their best defensive player for at least the next two weeks after Kevin Pillar was placed on the 15-day disabled list Monday. The star outfielder sprained his left thumb on a slide into a second base on Saturday in Kansas City and sat out Sunday's finale against the Royals. "It's just an unfortunate thing that happened just playing the game the way I've always played," said Pillar, sporting a protective blue covering over the injured thumb. "It was a bad slide and [the team] made the decision they felt was best for our team going forward." Jays manager John Gibbons described the injury as a torn ligament, one that needed to "calm down" before Pillar could return to play later this month. He was unsure if surgery would eventually be required. A model of health despite his hard-charging style in the outfield, Pillar has played in 109 of 112 games this year after suiting up for 159 of 162 last season. Acquired from San Diego in a trade last month, Melvin Upton Jr. will take over the centre field duties in Pillar's absence. Upton has only four hits in 32 at-bats since he joined the Blue Jays, none for extra bases. Gibbons figured it was only a matter of time before the 31-year-old, who hit 16 home runs with the Padres, started to get going offensively with the Jays. He believed Upton was still adjusting to his new surroundings in Toronto, but lauded his defensive abilities in centre field. "It's important to have experience out there in that spot," Gibbons said. Pillar wore a protective mitt over his hand earlier this season precisely to avoid an injury like this and vowed to do so again upon return. He'd also changed his sliding tactics at one point earlier in the year, only to revert back to what was most comfortable. Pillar expected to only miss the minimal amount of time after meeting with a hand specialist on Monday. "My level of pain tolerance is different from most; I can get by with the pain. For me, it's just about being able to go out and not hurt the team by being a guy that's in the lineup. "If I can't swing the bat the way that I want to swing the bat, if I can't squeeze the glove the way I want it squeezed then I won't go out and play." Darrell Ceciliani was recalled from Triple-A Buffalo in a corresponding move. The 27-year-old, who has 14 hits in 71 career at-bats in the big leagues, started in left field on Monday night. Pillar is batting .261 with seven home runs, 10 stolen bases and 45 RBIs this season. He's tied for second on the Jays in WAR (2.6), trailing only MVP-candidate Josh Donaldson.